What a lovely Christmas present - having the privilege of taking wedding photos at Horton Grange Hotel for this delightful couple, Dianne and Pete. I was booked to do just 3 hours of photography but the range of photos we captured shows what can be achieved within a relatively short space of time. We started with some of the preparations. The bedroom used at Horton Grange was beautiful - spacious, light and airy making for some really clean and classy images. A quick zip downstairs to find the groom and we decided to brave the slightly chilly weather outside to get a few photos ahead of the main event. Then, speeding back upstairs, Dianne was miraculously almost ready and looking fab! A quick 20 questions with the registrar and it was time for the big entrance. A perfect, intimate ceremony followed complete with all the emotions stirred by a really good wedding including laughter and a few tears from some. Owing to the fact that this wedding was held just a week away from the shortest day of the year, it was dark by the time the ceremony finished, but with the help of a little photo lighting gear we still managed to get a group photo of everyone on the steps outside the hotel. We could have done all the group shots the bride and groom wanted outside too but in the interests of keeping their guests warm we opted to set these up indoors next to the Christmas tree instead. We did however take a few more minutes with Dianne and Pete to get some outdoor shots of the two of them first. Finally it was back inside to warm up with some photos by the tree and for them to take a look at the room waiting for their intimate wedding breakfast…. …which naturally looked stunning, complete with roaring cozy fire. Just what was needed! Horton Grange always comes up trumps as a wedding venue and this was no exception. A small and select gathering, it had a lovely family feel to it and the relaxed, refined setting was perfect for the occasion. To say we are over the moon with our wedding photos is an understatement. 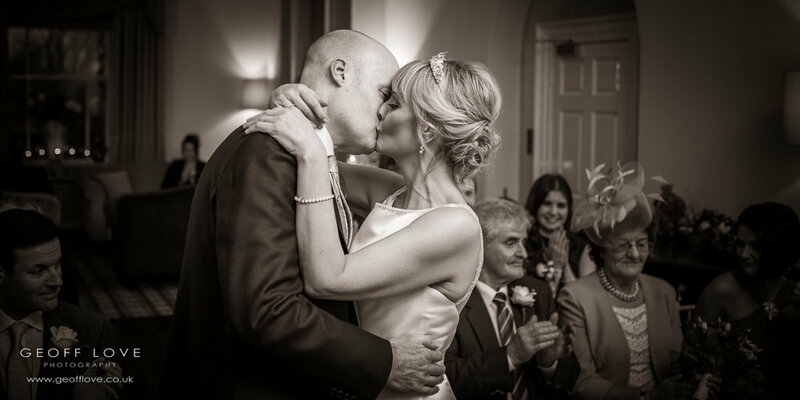 If you are thinking of getting married at Horton Grange Hotel (or anywhere else for that matter) and like the style of these photos please get in touch to chat about your big day and find out about my availability and packages.